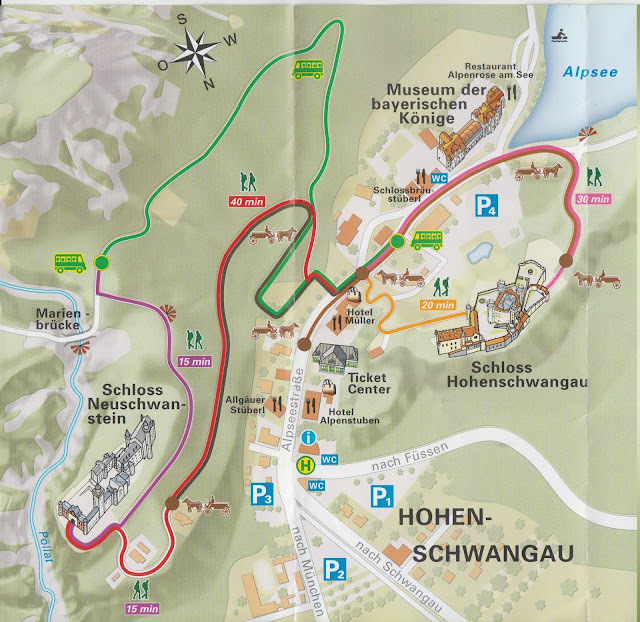 Another Long Walk: Post 18: Neuschwanstein! What a great trip! I was surprised to see how tall and narrow the castle appears. I forget Sleeping Beauty's Castle is "inspired" by that castle and not a duplicate! When I was there, one of the members of our group was allowed to play his bugle in the throne room. It sounded great! FYI, we were travelling with our community band - hence the bugle. We were lucky to find a letterbox just across the scenic bridge when we were there a few years ago. The overall scenery in that area is beautiful. I took the horse drawn carriage ride but I felt so sorry for the horses; it was a steep climb and the horses were dripping with sweat at the top. I don't this there wa a bus option when I was there (May 1999).